For more information about his music, see Prince Music. From Supply and Demand, pg. 263: I was doing a show in Minneapolis, and I decided to use the opportunity to create a web of puns with this poster. 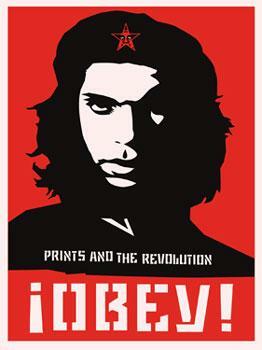 Prince is one of the most famous figures from Minneapolis, and I create screen prints, often of pop icons; his band in the ‘80s was called the Revolution, and my work uses a lot of revolutionary material like the Che Guevara image; so it all seemed to fit together nicely.